"The wide range of reliable products we offer under our own Kramp brand is of the highest quality, designed for professional, intensive and, above all, safe use. Customers are guaranteed detailed product information, an optimum finish and, of course, the very best service we can offer." Kramp. It’s that easy”. Kramp makes work easier and more efficient for its customers. Kramp, the largest technical wholesaler in Europe, has set this as its mission. 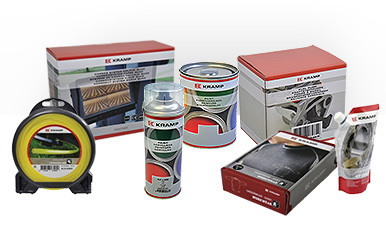 As a one-stop supplier of spare parts, technical services and business solutions, Kramp acts as a strategic partner to businesses in the agriculture, forest & grasscare sector, earth-moving and OEM. With 21 sites in 19 countries and around 1, 600 employees, Kramp ensures that customers throughout Europe get the correct parts on time. The webshop gives customers access to hundreds of thousands of products. Kramp sets itself apart with its extensive range and high stock levels, and if you order before 6pm, you will receive the parts the following day. In addition to original parts, Kramp also supplies top brands and alternatives.